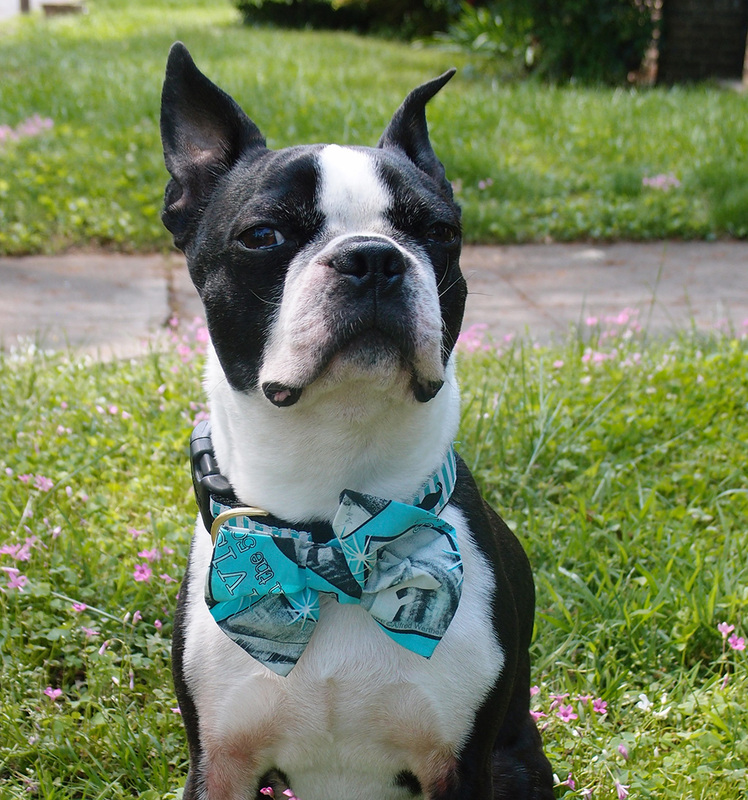 DIY No Sew Bow Ties for Pets! Happy Monday friends! For years Basil, being the 1st class hipster that he is, has been wearing bow ties. 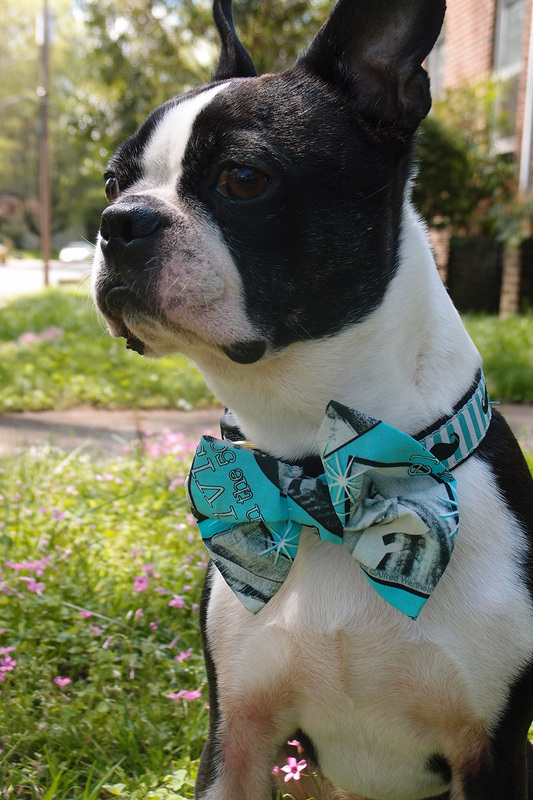 And for almost that same amount of time I have been purchasing him those bow ties. Okay so the cost isn’t that much each time, 1 bow tie retails for about $10-$20 but in the long run, that cost really adds up! 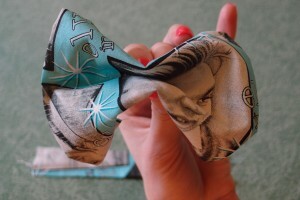 So after buying Basil’s 20th bow tie (I know, I’m crazy!!) I figured I could make these, so I did! 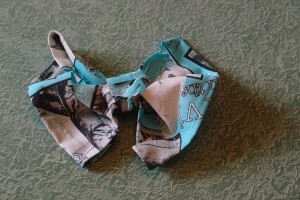 Below you will find my simple DIY No Sew bow tie tutorial. Hopefully it works for you and your dog can look like a gentleman without breaking the bank! Step 1: There is a few things you’ll need! 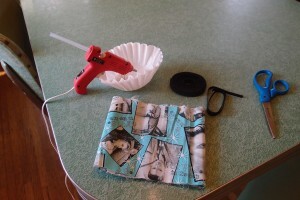 The great thing about this project is most people have a lot of these craft supplies already in the their home. If you need anything on this list all of it can be found at your local craft store. I highly recommend using double-sided Velcro and it can be a little tricky to find. I ordered mine online(http://www.etsy.com) at a great deal. 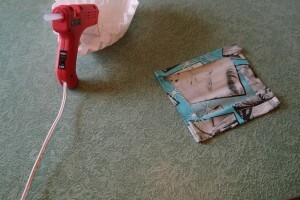 I also use a standard hot glue gun on the high setting. For my fabric, I found an amazing deal in the remnant fabric bin at Hobby Lobby. It was 1/8th a yard and only .59 cents! 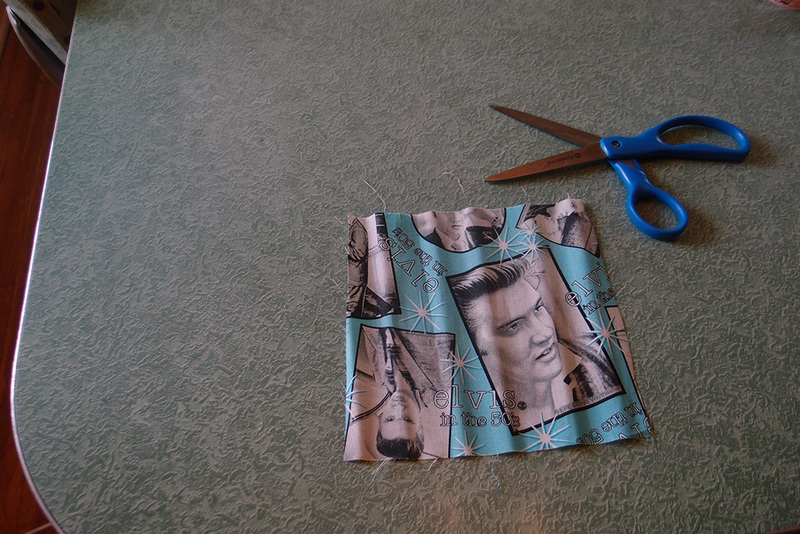 Also, I couldn’t pass up the Elvis in the 50’s pattern! Step 2: Cut out a square! The size I picked was about 6 inches by 6 inches. This bow tie is going to be a little large for a medium size (20 lb.) dog but that how I like it. If you want a smaller tie make the square smaller. Step 3: Flip square over and glue edges down! It doesn’t have to be perfect! I glued the “hot dog” sides first and then the “hamburger” sides. You really just want to make clean edges for the front of the bow tie. 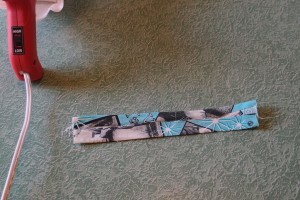 Step 4: Cut a small rectangular piece for the center of the tie! 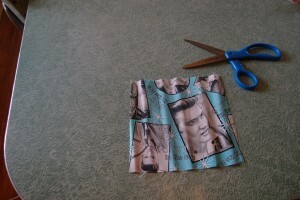 I cut a 2×6 inch piece of fabric. Make sure the length is 3 times the size of the width. I flipped the fabric over and glued the edges down like I did with the first piece of fabric. 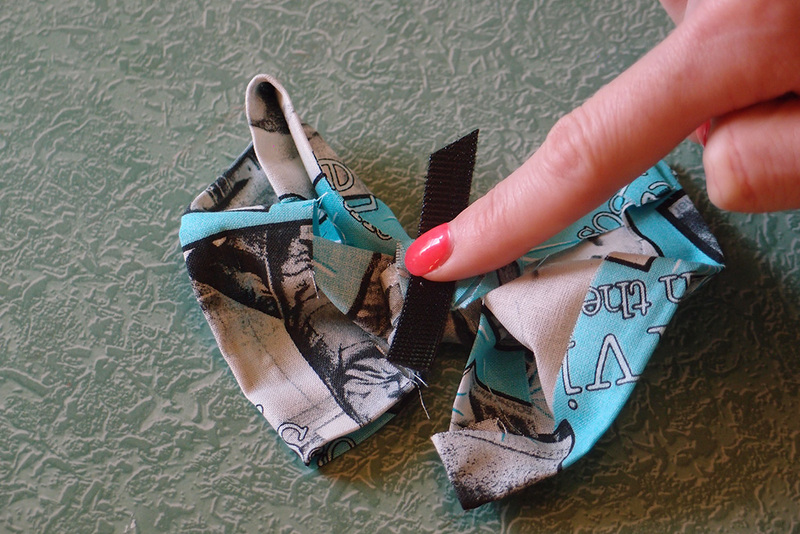 Step 5: Pinch to make your bow tie shape! Pinch the large square that you created, from the back, to make the bow tie shape that looks best to you. When I did this it made Elvis’s face a little weird. 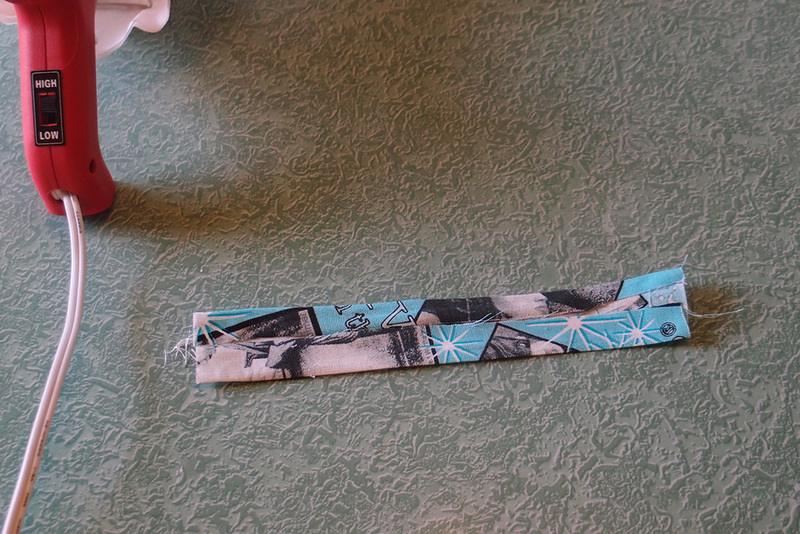 Step 6: Tie the long rectangular piece around the pinched square. Knot in the back! Make sure the fabric is laying flat on the front. Knot fabric in the back and glue flaps down. This is also a great time to glue down what doesn’t look right! Step 7: Measure & Attach Velcro! 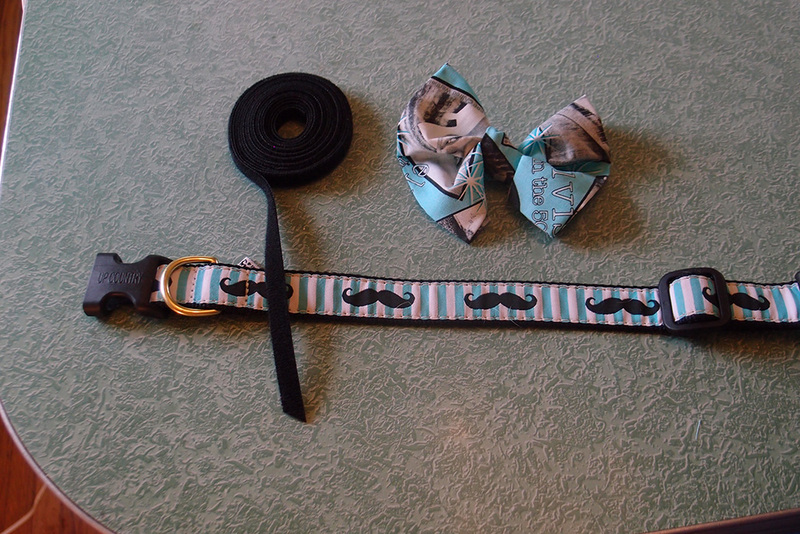 I grabbed one of Basil’s everyday dog collars and placed the double sided Velcro on top to see how much I needed. For a 1 inch collar I recommend at least 2 inches of Velcro. I cut the Velcro and glued the strip on to the center, back of the bow tie. Make sure to place the glue on the soft side of the Velcro! This way the Velcro teeth can grab onto the collar as well as the other side of the strip. If you prefer to use elastic you can glue a loop of elastic band in the same spot. Step 8: Attach to collar and look awesome! Wrap the Velcro around the collar in your preferred area. Think about how the collar is going to hang and sit once on your pet. Look how cute he is! 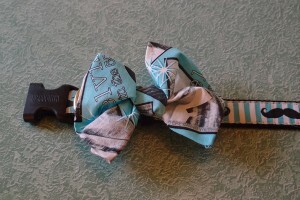 This bow tie is cute, easy, and lightweight. I hope you enjoyed this tutorial. Show me your pictures of your creations! Tomorrow is Travel Tuesday and the featured city is San Antonio, Texas! So make sure to check back then!